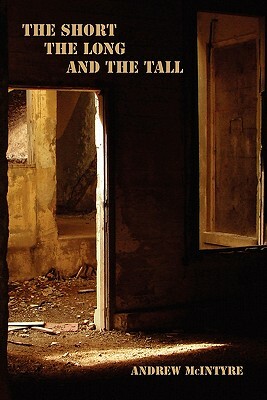 The Short, the Long, and the Tall by Andrew McIntyre published by Merilang Press Andrew McIntyre was the writer of two of the best short stories ever to appear in Gold Dust magazine, Dirty War and the equally dark sequel Snuff. The two appear together in this collection, which at first glance seems to squeeze no fewer than thirty-four stories into its hundred-and-forty or so pages. This, however, is somewhat deceptive, as many of the stories might be more accurately described as sections that follow on from one another to constitute single narratives. Another stylistic oddity that readers of the collection will need to get used to is McIntyre's refusal to use quotation marks or any other form of separation between dialogue and narration. As a technique this is no longer all that unusual and I found that I adapted to it quite quickly, but it does produce rather large, dense single paragraphs which can be daunting on the page, and it requires you to read more slowly than usual, which may be a deliberate aim of the author. I have yet to be convinced that the format yields any positive advantages, but am keeping an open mind. The recurrent theme of the collection is war and armed conflict, mostly under the tropical sun in far away places. McIntyre's central characters are typically hard-bitten chain-smoking Westerners, thoroughly disillusioned former idealists, we suspect, cynically playing whatever role they have slipped into in the local attempt to realise Dante's Inferno. The over-riding message seems to be that war attracts or where necessary creates the vilest monsters that can exist in human shape. What we get from these tales is a thoroughly jaundiced yet strangely compelling view of the human race as a bickering, mean-spirited pack of predators driven by a need to dominate and subdue. There isn't really anybody to like in McIntyre's stories, and this I think may constitute their only weakness. We long for contrast, light and shade, angels to counterbalance the devils, and they aren't really there. But aside from this it is extremely difficult to find anything to criticise in the way these tales are told or constructed. They are nicely-paced, highly atmospheric, and have a good balance of narration, description and dialogue. It's easy for the reader to enter imaginatively into the world of each story, and enough space is left for us to interpret things in our own way. The characters are rounded and believable, extreme at times but never caricatures. There is a brilliant creative mind at work behind these offerings, and if you have a strong enough stomach to survive them it's a collection that will engage, repel, fascinate, and live on in your imagination long after you have turned the final page.